A Guide To The Best Diet for Cats | Purrrfectly Holistic Purrrfectly Holistic…a Boutique for Cats! The old saying, “You are what you eat” is really true when you think about it. What you put into your body has consequences whether they be good or bad. The same can be said for what we feed our cats. With so man choices on the market how do you really know what is the best diet for cats? If you look closely at the label of your cat’s food you may see some questionable ingredients, even words you can’t pronounce! Do these ingredients even sound like something your cat should be eating? Let’s take a closer look. Cats don’t have the amylase enzyme that breaks down starches, so a grain-free diet is crucial. Cats didn’t hunt fish in the ocean originally, so this food type is not part of their evolutionary diet. In traditional Chinese medicine fish contributes to inflammation, so limited intake of fish is recommended. Commercial cat food is heated to high levels during processing which destroys or diminishes the natural enzymes, vitamins, minerals. Therefore, a commercial diet requires supplementation. This process also reduces the ability of amino acids to be digested. Most inexpensive commercial pet foods use plant-based proteins as a protein source rather than meat-based protein sources which are superior. The high quality proteins (muscle meat, organs and bones) are easily digested, absorbed and used. The inferior sources of protein are not easily digestible, if at all. Therefore, avoiding things like meat by-products and lower quality protein sources are a must. Look for brands whose meats are free of pesticides and antibiotics, and if possible, free-range or pasture roaming animals. Avoiding genetically modified (GMO) food is also a must. Water is essential. Most cats don’t naturally seek out drinking water, but if their diet is raw or from high quality canned food then the moisture content is already high. This is found in heart and liver and is essential for survival as cats’ bodies don’t produce it on their own; they have to acquire it in what they eat. Specifically, essential fatty acids like Omega 3’s and Omega 6’s. These are essential for energy production, among other things, and must be obtained from their food. Look for these on your labels: omega-3 fatty acids, which include alpha-linolenic acid, eicosapentaenoic acid, and docosahexaenoic acid; and omega-6 fatty acids, including linoleic acid, gamma-linolenic acid, arachidonic acid, and conjugated linoleic acid. These are “involved in almost all physiological reactions. They contribute to enzyme formation, pH balance, nutrient utilization, and oxygen transportation and are stored in bone and muscle tissue. Minerals include calcium, chloride, chromium, cobalt, copper, fluorine, iodine, iron, magnesium, manganese, molybdenum, phosphorous, potassium, selenium, silicon, sodium, sulfur, and zinc.” ³ They often work synergistically, which means they cooperate and work together. These are essential in metabolism, growth and function of the body and include both fat soluble (A,D, E and K) and water soluble, (B and C). Cats utilize vitamins from animal sources more easily, so it’s important they obtain them from their food. This ingredient is linked to diseases including obesity, chronic inflammation, cancer and diabetes. Corn products often include mycotoxins and mold which damage cats’ kidneys and liver. Most of the corn products used in processed foods are genetically modified, which is another reason to avoid it. Cats’ bodies were never designed to process carbohydrates for energy but rather amino acids (proteins) and fats. Dr. T.J. Dunn D.V.M. believes “There is ample proof that today’s pet dogs and cats do not thrive on cheap, corn-based pet foods. Dogs and cats are primarily meat eaters; to fill them up with grain-based processed dry foods that barely meet minimum daily nutrient requirements has proven to be a mistake.” ² Manufacturers like to use these products as cheap fillers to replace meat. This has been linked to allergies and intolerances to wheat and wheat gluten. Wheat gluten contamination associated with pet food recalls caused kidney failure and death. This is another cheap protein source that carnivores were never meant to eat and is a common allergen source. Most of the soy produced (greater than 89%) is genetically modified (GMO) which should be avoided at all costs. GMO foods are not natural nor safe for human or pet consumption. All these products are basically used as fillers. Powdered cellulose is essentially sawdust and this is commonly used in attic insulation. Rice hulls are also used in building materials, insulation and fuel. These are essentially leftover wastes from human food consumption, and are categorized as “named” or “un-named.” As defined by AAFCO, the Association of American Feed Control Officials, the organization that creates guidelines for livestock feed and pet food, “Chicken by-product meal consists of the ground, rendered, clean parts of the carcass of slaughtered chicken, such as necks, feet, undeveloped eggs and intestines, exclusive of feathers, except in such amounts as might occur unavoidable in good processing practice.” Un-named by-products include “meat by-products”. Animal fat is often sourced from dead, dying, diseased, or disabled animals and can often cause the pet food to have a very unique or pungent odor. Used restaurant grease is also rendered animal fat unfit for human consumption. As defined by AAFCO, “Meat Meal consists of the rendered product from mammal tissues, exclusive of blood, hair, hoof, horn, hide trimmings, manure, stomach and rumen contents except in such amounts as may occur unavoidably in good processing practices.” It is still legal for pet food manufactures to source these products from dead, dying, diseased, or disabled animals. This is rendered product from mammal tissues including bone, and has also been found to include animals who have been euthanized. Ann Martin, in her book, “Food Pets Die For”, exposed this revolting practice and the detection of sodium pentobarbital in pet foods, a veterinary drug used in the euthanasia of pet animals. These are all powerful chemicals used to prevent fats from going rancid. BHA, BHT, and TBHQ are all petroleum derived preservatives often used in food and hygiene products. Ethoxyquin has been banned for human consumption because it is believed to cause cancer. Manufacturers are not required to list this on the pet food label, and it is most commonly found in meat and fish-based ingredients. Propyl Gallate is used in foods, cosmetics, hair products, adhesives and lubricants. The use of these harsh chemicals are known to cause cancer, toxicity, and are neither inert or safe but are widely used in pet products. They are simply used as means to provide long shelf life. Table sugar is used to make the products taste better, but it provides no nutritional value to pets. Manufactures use artificial colors to make the product more appealing to consumers, essentially a marketing trick; there is no nutritional reason to include them. These products are synthetic chemical dyes and there are cases that link FD & C colors to cancer and other health problems. Now that you have read this list of offensive ingredients, do you understand why they should be avoided at all costs? Why would anyone want them in their cat’s food? While kibble diets have certainly made feeding cats convenient and inexpensive, it has done nothing to improve their health. In fact, it is the proverbial “elephant in the room” when it comes to cat food. Manufacturers started producing kibble back in the late 1800s using leftover ingredients that weren’t fit for human consumption from the human food industry. To make kibble a grain or starch of some kind is required because it needs something to hold it all together. This is why corn, wheat, potatoes, peas, beans, tapioca, quinoa, etc, are used. During the manufacturing process this concoction of meat, meat by-products, rendered fats, meal meal, powdered cellulose, dried beet pulp, carcasses, chemicals, preservatives, flavor enhancers, and artificial colors are cooked in huge vats to high temperatures. This cooking process produces two types of carcinogenic by-products: heterocyclic amines (from proteins) and acrylamide (from starches). This soupy mix is squeezed through machines that make the pellets and shapes we know as kibble. It’s then poured into bags with liners that contain PCBs and phthalates which are also known to cause cancer. In the end we have a product that is void of living enzymes and naturally occurring vitamins and minerals and replaced with synthetic ones, preservatives, dyes, flavor enhancers (chemicals to make it taste good) and cancer-causing ingredients. Most people feed this to their cats everyday without a second thought and don’t realize they’re setting their cat up for health problems in the future. Pets previously fed table scraps of meat or wild prey now are fed things never intended to be consumed as food. Their health has been sold out to convenience, shelf life, and profit. To learn more about the kibble-cancer connection check out this article. They simply don’t need fruits, vegetables, grains or starches because their bodies don’t produce the enzymes necessary to break these down. If you’ve been feeding your kitty a processed, dry diet and want to switch her over to a raw, more species appropriate diet, it may be difficult. She’s gotten used to her “fast food” low quality food, which I like to compare to junk food, and who doesn’t like the taste of that versus something really healthy for you? Start by trying freeze-dried products as a treat. You can also crumble these on top of their regular food and let them gradually adjust to the taste. Freeze dried food can also be re-hydrated by adding warm water to create a “wet” food. There are many brands of commercial frozen, raw food for cats on the market that are excellent. However, this can get expensive. You may also explore preparing a homemade fresh raw or lightly cooked diet for your cat. Purchasing fresh meat from the butcher or meat department and using a pre-mix that you add in to make it balanced is a wonderful, more economical, alternative to buying commercial brands of raw food. 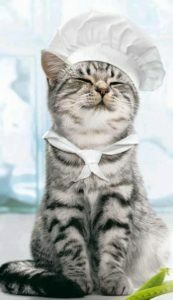 If you’re up for the challenge of piecing together all the necessary ingredients (vitamins, minerals, fats, enzymes, etc,) that cats need you can check out recipes from Dr. Lisa Pierson, DVM (link below). Personally, I find it’s so much easier and less time consuming to use a pre-mix! As you make the transition, give more and more of the “new” food and less and less of the “old” food until they’ve adjusted. For some cats this can take a very long time, and other cats, especially kittens, successfully change within days or weeks. It’s also important to rotate proteins and not feed the same one all the time in order to avoid developing food sensitivities and to give your cat variety. Who wants to eat the same food every single meal for a lifetime? No one! Not even your cat. If your cat is already used to wet, canned food, the transition should be easier. I truly believe they can taste and appreciate the difference of high quality canned food versus cheap, inexpensive brands. A great nutritional foundation is paramount to a cat’s health and longevity. Making the effort to provide a diet that is balanced and biologically appropriate will give her a much greater chance of enjoying a longer, healthier life with you.